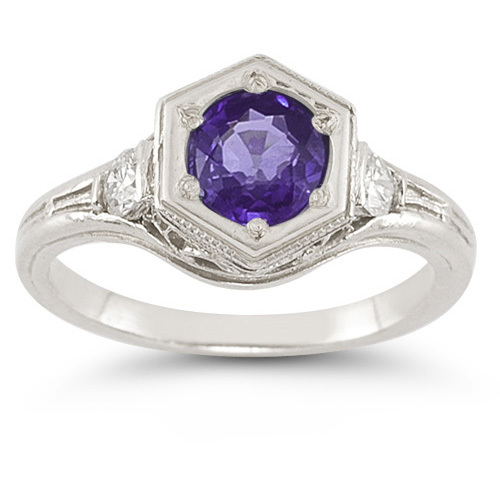 Art Deco style amethyst ring set with two 3.8mm white Sapphire on each side for a total of 0.16 carats of white Sapphire. Amethyst measures 6mm round and is set in .925 Sterling Silver. Also available in 14K White Gold, 18K Gold or Platinum by request. To find out more about our gemstone ratings, please read our blog. We guarantee our Roman Art Deco Amethyst and White Sapphire Ring in .925 Sterling Silver to be high quality, authentic jewelry, as described above.